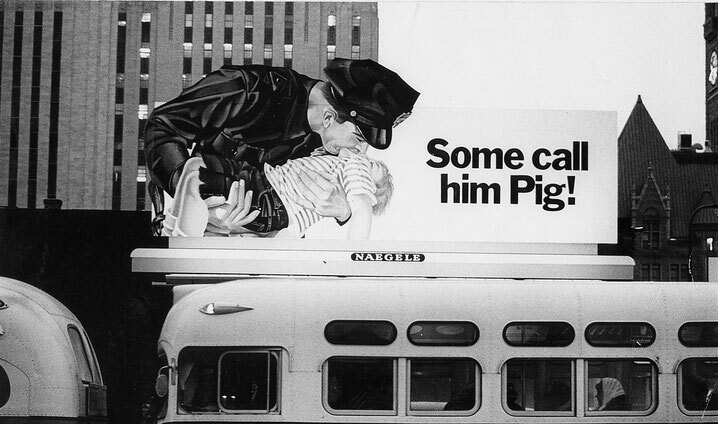 This work concerned a billboard, an enormous advertisement that the Minneapolis police department had produced and put up in various parts of the city to extol the merits of its agents, who were referred to as “pigs” in the slang of the student protesters of the time. The only European observer, Pettena underlined its “contradiction in terms” and unintentional irony, incomprehensible to the Americans of the mid-west. “That poster was paid for by the police department to celebrate the courage of their agents, but faced with the image of a policeman kissing a little boy on the mouth, I said that it was no surprise they were called ‘pigs.’ But I was the only one to have seen it as a kiss and the others saw nothing funny in it” (G.P., from L’anarchitetto).